The ad and the industrial disintegration form an fresh aesthetic that Gamma develops by pairing contrasts: the rotting and the brand-new, the industrial and the organic, the commercial and the candid. The organic is an especially nice touch, since sci-fi tends toward the metallic and seamless. The outsize green fungi are mysterious and terrifying, like much of untamed nature. And again, as with Seed, if I don’t understand what’s happening, it’s hard for me to care, which is an important test of a movie. It’s too bad. 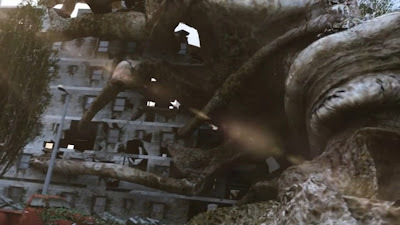 Compared to the sci-fi of the other shorts I’ve looked at in this series, the biological technology of this short had maybe the richest potential for both metaphorical and narrative possibilities. The idea that an fungus-like organism would fix our environmental mistakes could say a lot about our relationship to the natural world, one infrequently examined in pop culture. As is, however, I’m just too lost to really get involved. This entry was posted in daisy dukes (shorts) and tagged sci-fi by underplex. Bookmark the permalink.